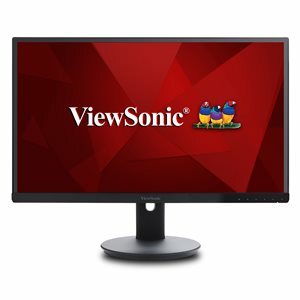 With future-proof connectivity and advanced ergonomics, the ViewSonic VG2253 is a productivity-boosting monitor perfect for corporate, government, and education environments. Designed with SuperClear IPS panel technology for wide-angle viewing and incredibly vivid colors, this monitor also features a 3-sided frameless design for a seamless viewing experience in multi-monitor setups. For maximum comfort and a customized fit, a robust fully ergonomic stand gives you tilt, pivot, swivel, and height-adjustable options. In addition, VDI client endpoints can be easily attached to the stand's integrated client mount, saving desktop space and minimizing cable clutter without interfering with ergonomic functionality. Extensive connectivity options include VGA, HDMI, DisplayPort, and Mini DisplayPort so that you can connect to a variety of HD and analog devices - today and tomorrow. dimensions 7.4" x 15.2" x 1.9"
With future-proof connectivity and advanced ergonomics, the ViewSonic® VG2253 is a productivity-boosting monitor perfect for corporate, government, and education environments. Designed with SuperClear® IPS panel technology for wide-angle viewing and incredibly vivid colors, this monitor also features a 3-sided thin-bezel design for a seamless viewing experience in multi-monitor setups. For maximum comfort and a customized fit, a robust fully ergonomic stand gives you tilt, pivot, swivel, and height-adjustable options. In addition, VDI client endpoints can be easily attached to the stand’s integrated client mount, saving desktop space and minimizing cable clutter without interfering with ergonomic functionality. Extensive connectivity options include VGA, HDMI, DisplayPort, and Mini DisplayPort so that you can connect to a variety of HD and analog devices – today and tomorrow. An edge-to-edge SuperClear IPS panel delivers accurate colors and vivid images – all framed by a barely there, ultra-thin bezel perfect for nearly seamless multi-monitor setups. And with ultra-wide viewing angles, you’ll enjoy stunningly detailed images, unbound and without borders, no matter your vantage point. DisplayPort, HDMI, and VGA inputs give you the freedom to connect your monitor to a variety of devices. ViewSonic’s exclusive ViewSplit software allows you to create an ideal and customized working atmosphere on your ViewSonic screen. Just choose from a selection of pre-defined templates, or create your own customized layout, and ViewSplit will divide your screen into multiple viewing windows. By allowing you to simultaneously view and work on multiple applications, ViewSplit boosts productivity and multitasking. With EPEAT Gold Certification, this monitor delivers a reduced environmental impact over the complete product lifecyle, making it a great eco-friendly, long-term investment.